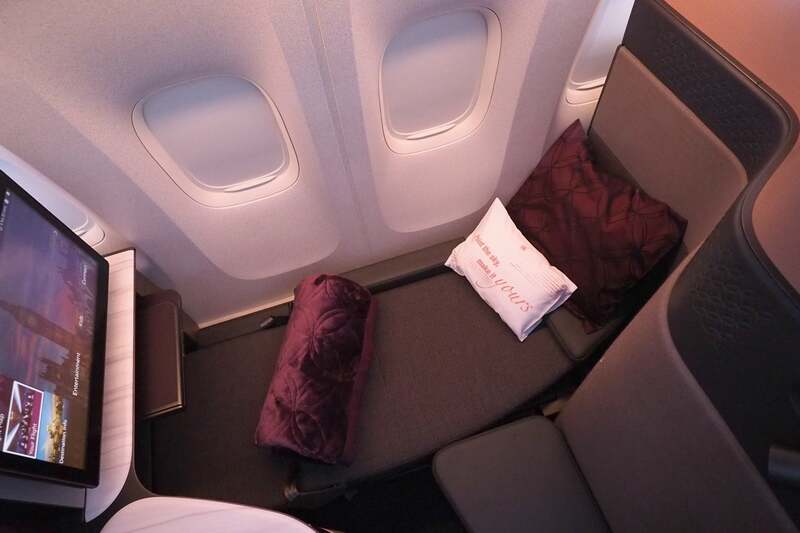 Qatar Airways’ Qsuite business class? Truly revolutionary. I just got off the inaugural flight from Doha to London, and boy am I impressed. I’m so blown away that I’m convinced Qsuite is the world’s best business class. 1. There’s a sliding door at every seat. I mean look at that! I was so impressed that I made my very first GIF. My flight attendant opened the door to bring me food and drinks throughout the flight, but otherwise it stayed shut, giving me my own private (albeit small) cabin on the 777-300ER. 2. It’s perfect for couples. No, you’re not going to want to join “the mile-high club” in Qatar’s Qsuite — it’s not that private. But being able to sleep next to a loved one on a plane is a pretty cool experience; one that, until now, was reserved for passengers traveling in first class. Everyone I saw sitting in Qatar’s “honeymoon seats” kept the center dividing wall raised for the entire flight, so there didn’t seem to be much interest in a side-by-side snooze today. Still, I’m sure couples will take advantage of this feature from time to time. 3. The seat is super high-tech. Do I need an HDMI port at my seat? No, especially when I don’t have a device to power it. But there is one there. And two USB ports, and a power port, and a touchscreen remote, and a big HD monitor and the most straightforward seat controls I’ve seen to date. Of course, my favorite feature is entirely analog — and that’s the sliding door (scroll on up to #1). 4. The amenities are top-notch. Qatar’s amenity kit will give other biz-class kits a run for their money, but it doesn’t stop there. You also get a mattress pad, a super-comfortable new blanket, two pillows and more. Qsuite passengers can also request pajamas (that you can keep after the flight), however they hadn’t been boarded for today’s departure, unfortunately. 5. Restaurant-quality food, whenever you want. 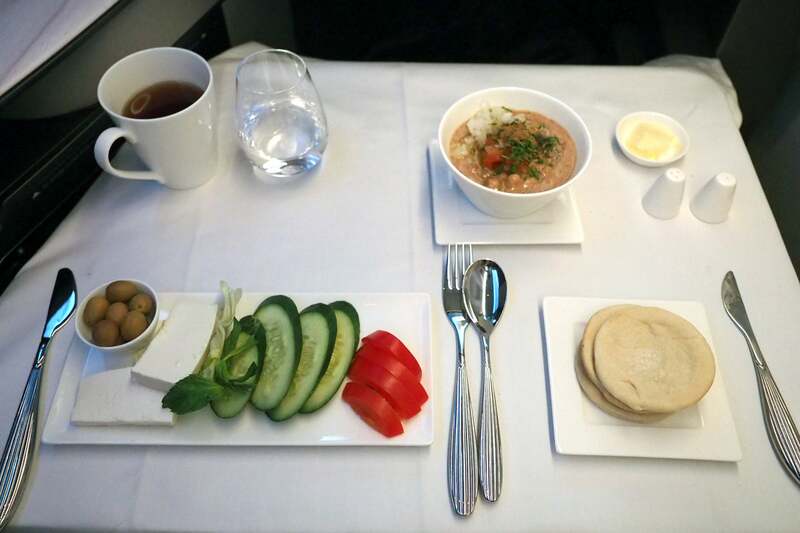 As TPG contributor Michael Park explored in his feature article, The Science of Airplane Food: How Chefs Trick Passenger Palates, there’s an awful lot that goes into preparing the food you eat at 35,000 feet. No, Qatar doesn’t offer a Singapore-esque “Book the Cook” service, but I’d rather have an excellent dish that I pick on the plane than a decent-to-very-good one that I’ve selected a few days in advance. Qatar’s also mastered the on-demand dining concept — if you aren’t hungry right after takeoff, that’s no problem at all. You can select anything you’d like from the menu at any time during the flight, and it’ll arrive piping hot (or whatever temperature it’s intended to be served at) in just a few minutes. 6. There’s a fantastic lounge in Doha. Sure, the crowds can be overwhelming during peak times, but that certainly isn’t a problem right now. Either way, Qatar’s Al Mourjan Business Lounge is one of my favorite airport hangouts in the world, and Qsuite passengers get access, of course. There are showers, nap rooms, two restaurants with high-quality western and Middle Eastern options, loads of seating and more. My jaw dropped the first time I walked in. It’s impressive. 7. There’s great award availability. Perhaps most important of all — for TPG readers, at least — is the fact that this is a product you can actually book with miles. 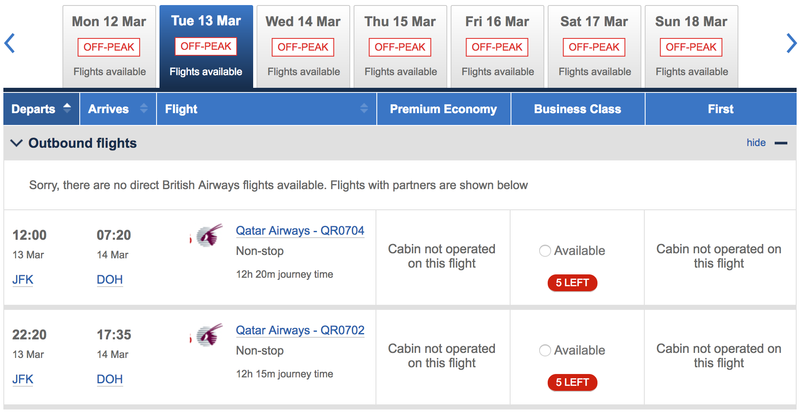 It’s not clear when Qsuite will launch on the Doha-New York route, but it should be sometime this year. Fortunately, I’m seeing five business-class award seats available pretty consistently, at least in 2018. Just be sure to book the 777 and not the Airbus-operated flight (although the A350 is a great ride as well) — as of now, Qatar flight 702 is the one you want. 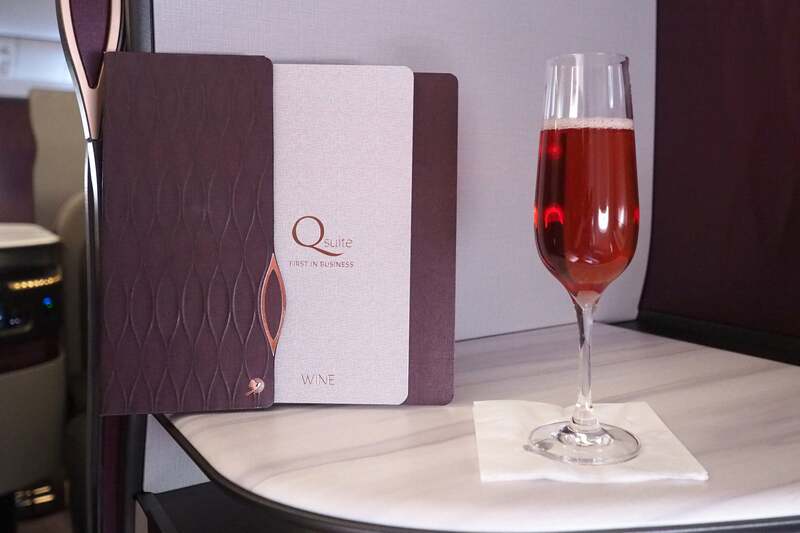 For more, see JT Genter’s post How to Search and Book Qatar Airways’ Qsuite With Miles. If Air India’s 777-300ER had even a tiny fraction of the polish of Qatar’s, I wouldn’t have felt compelled to write this post. 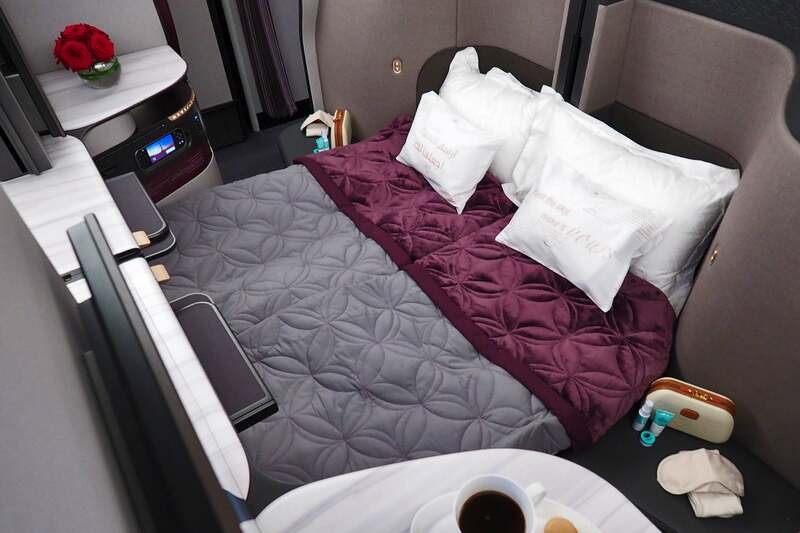 Fortunately, you’ll soon be able to fly Qsuite almost all the way to India — and I wouldn’t hesitate to connect in Doha just to avoid AI’s 777. Overall, Qatar’s Qsuite is great. Really really really great. But, like every other product I’ve flown, it isn’t perfect. For one, there isn’t any Wi-Fi onboard — and that’s a huge disadvantage, especially on ultra-long-haul flights like Doha-New York. I’ll run through some more pros and cons in my full review (coming very soon), but in the meantime, it’s definitely safe to say Qatar did a fantastic job here. Have you booked a flight on Qatar’s retrofitted 777-300ER?